This post is sponsored by my good friends at Hurst?s Hambeens ®. When I was asked by my good friends at Hurst Hambeens to develop a Vegan Chili Recipe for them – it was really kind of simple. Take my own award-winning chili recipe and combine it with their 15 Bean Soup Mix and see what happens. Right"
Pure deliciousness! That’s what. This truly is the best Vegan 15 Bean Crockpot Chili ever! I wanted to make this recipe even EASIER by eliminating any kind of meat-substitute at all, AND by making it in a crockpot (or slow cooker). So there are NO weird ingredients that you may not like or can’t find in your average grocery store…. Just beans, tomatoes, some simple veggies, and one of the richest Texas-style chili broths you’ve ever tasted. 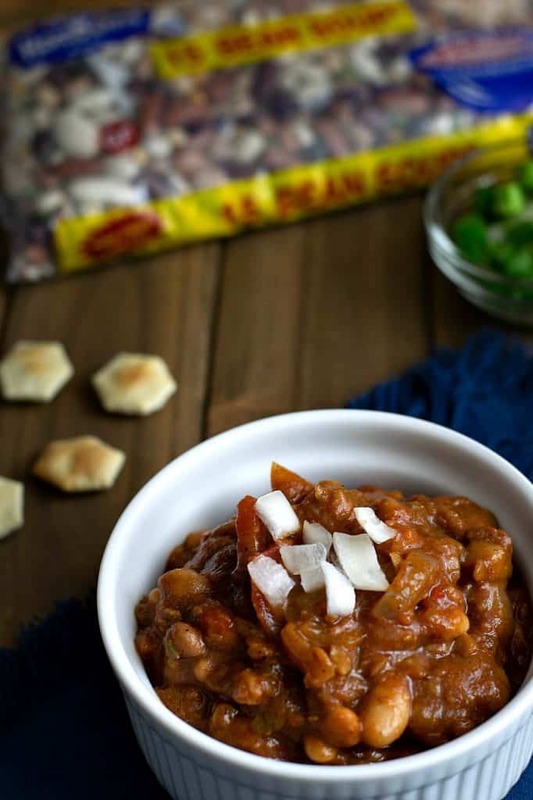 In other words – pure Vegan 15 Bean Chili !! But what about those little bags of 15 Bean Soup Mix" Where do I find THOSE"
You can click on this WHERE TO BUY link to find the nearest location to pick up a bag or two of the Hurts Hambeens 15 Bean Soup Mix. I live just outside of Portland and found FOUR locations near me that carry them. If you have a Wal-Mart nearby – you should be able to find them. Why the crockpot this time"